An aromatherapy essential oil is usually sold in dark glass containers. The color of the bottle should preferably be amber rather than cobalt blue. Only blended oils can be stored in cobalt blue bottles. Do not buy aromatherapy oils that stored in plastic containers because essential oils will degrade plastic materials. I see the difference in price between cobalt blue bottle and amber dark bottle. 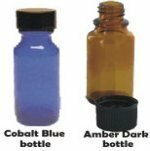 It appears that cobalt blue bottle is more expensive than the amber dark. Since it's not make a big difference in their quality to use amber dark bottle for the blends, some of the essential oils suppliers use this bottle for their custom blending. This will make their selling price cheaper. Notice the label of the essential oil. Pure essential has a therapeutic value sold as therapeutic grade. Not all essential oil has a therapeutic value. Fragrance oil, hydrosol, absolute, are not essential oil. These oils are sold less expensive than the one that has therapeutic value. Essential oils have different grades which differ from one to another supplier. Low prices may also mean the oil is a second or third distillation of the plant material, in which case it will have far less therapeutic value. Its important that we should know the Latin botanical name of the plant material. It is also helpful to note the country of origin for the oil. Most reputable company will stated the botanical names and the country of the origin of essential oils which they sell. If you want to compare between each of the seller then I'd suggest you look whether the oils they produce are organic or wild crafted. If you use the recipe in this site, Please read the botanical name of the plant before you buy aromatherapy oils. It should be the same as I recommended. Find a reputable supplier, especially when you buy aromatherapy oils online. Read their refund policy and shipment term. To prove their oil's purity, you can ask the seller if the oils have been tested using Gas Chromatography by independent lab. Chromatography in which the substance to be separated into its components is diffused along with a carrier gas through a liquid or solid adsorbent for differential adsorption. It will only take one simple test to know if the essential oils that youre using are pure, or if they are instead petroleum-based solvent dissolved oils. You want to avoid this second variety, as they can cause definite environmental problems. Any petroleum based solvent has a long lasting impact on the environment, which is stored in the fat of the body, and can act as a great course for volatile organic chemicals (VOCs), which can impact indoor air quality. So how do you test if your essential oil formulation is pure? Place a few sample drops of the oil on a piece of blotting paper. All pure essential oils will not leave behind any kind of residue once it has evaporated, while petroleum solvents will leave a residue. Be Smart! Buy only Pure Essential Oil! Common Adulterations of Essential Oils. What makes an essential oil therapeutic grade? Find the answer to your questions! Aromatherapy Wholesale Products - Buy aromatherapy oils in bulk and save money! Find out how to find a good seller with good quality of essential oils on a bargain price. Why buy aromatherapy oils from mountain rose herbs? Mountain Rose Herbs has recieved "The Bold Steps to Sustainability Award," awarded by the Mayor of Eugene, Kitty Piercy. This was done in the Bold Steps program, which is an honor bestowed upon local business who make business decisions based on the concept of the triple bottom line, which is an expanded spectrum focus based on the triple bottom line. What is this triple bottom line? It is a business model that closely looks at economic, environmental and social values as a way to measure both organizational and societal success in industry.